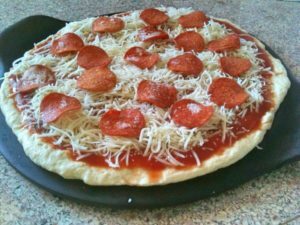 When we were first married, I tried numerous pizza crust recipes to find the best: the easiest, yeastiest, crustiest, yummiest! I finally found the best. I can make it in under 30 minutes, 45 minutes including cooking the whole pizza. 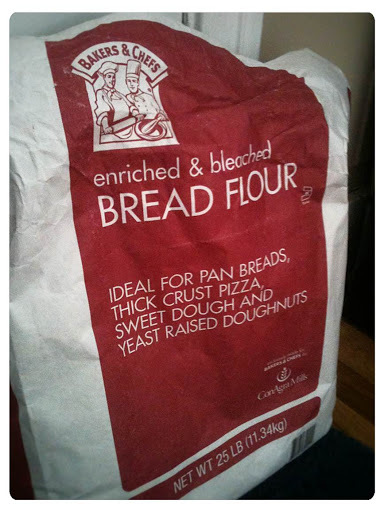 It does include bread flour and yeast, but I always have those on hand. I love this bread flour from Sam’s Club – 25 pounds for less than $10 is a great deal! We love topping this with a 8 oz. can of tomato sauce, Italian seasoning, diced onion and green peppers, shredded mozzarella cheese and pepperoni. Have fun! Make-your-own-pizza is a great dinner idea for tonight! Preheat oven to 450. Dissolve yeast and sugar in warm water. Let stand until creamy, about 10 minutes. Stir in flour, salt and oil. Mix/beat until smooth. Let rest 5 minutes. Turn dough onto lightly floured surface and roll into a round. (I just take straight from bowl and roll into a round on my pizza stone). Top with toppings, and bake in preheated oven 15-20 minutes.